I am not one of those people who bounces out of bed in the morning. And neither do my insides. We need help to get going in the morning- nice and easy does the trick. Your internal organs are in a different state when you sleep to when you are awake. During sleep they are busy repairing themselves, detoxing and resting. So when you wake up, they need to wake up as well. There are ways that you can can wake yourself up on the inside first thing in the morning, that will help your organs finish the detox night stage and move into an active lets-face-the-day mode. By waking them up gently and helping them transition you set yourself up for the day in an optimum metabolic state- alert and ready to start digesting and processing. And that has got to be a good thing! Often it’s our poor liver that takes the brunt of detoxing and processing. And with an overload of food, alcohol, toxins and preservatives our liver’s get sluggish and struggle to function at their optimum. 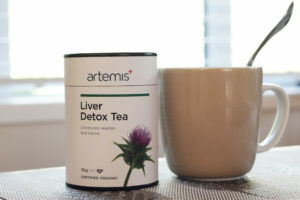 My nutritionist recommend a herbal tea first thing in the morning- Artemis Liver Detox Tea. It’s made of bitter green herbs (Calendula, Dandelion root, St Mary’s Thistle, Fennel Seed, Artichoke & Peppermint) that help the liver finish off the detoxing that it was trying to get through while you slept. Be warned- the word bitter is not in there as an add on! The amazing thing is though, as you persist with this herbal tea first thing in the morning on an empty stomach, your liver is able to function better and soon the tea does not taste as bitter. In fact, it becomes quite enjoyable. And no, that’s not because your taste buds have been fried, it means your liver is processing better. I was sceptical at first but I have been on the tea consistently for a month now and it really does taste a lot nicer. 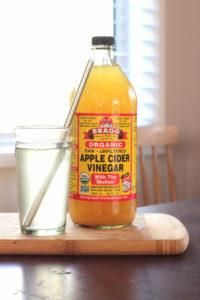 The third way to detox first thing in the morning is to have a big glass of tepid water with raw Apple Cidar vinegar. This is an incredible mix for detoxing and cleansing your insides. 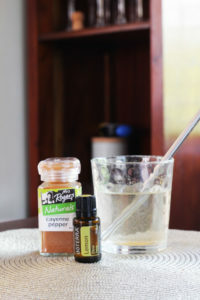 It will balance your body’s PH levels, aid in digestion, clean your intestines and improve skin tone. Win, win. Use a tablespoon or two in tepid water. If I am using either of the other 2 detoxes mentioned above first thing in the morning, I will have Apple Cidar Vinegar and water at least once during the day in-between meals.